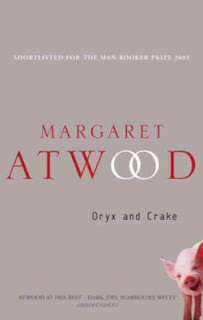 I know most people out there wouldn't agree with me on this one; but I thought Oryx and Crake was better than The Handmaid's Tale. This book was very nicely written and though I did think that the plot slacked a bit at places, it didn't stop me from being completely drawn into the book. The mystery, the "what the hell is happening"-feeling was just great. The only thing I hated about the book was that it was a library copy, and some crazy person had underlined (with a bold pen) words like toga and scamper and written down meanings in corners (which is worse than dog-earing the pages, according to me, anyway.) Sorry, not the point. A caterpillar is letting itself down on a thread, twirling slowly like a rope artist, spiralling towards his chest. It's a luscious, unreal green, like a gumdrop, and covered with tiny bright hairs. Watching it, he feels a sudden, inexplicable surge of tenderness and joy. Unique, he thinks. There will never be another such moment of time, another such conjunction. These things sneak up on him for no reason, these flashes of irrational happiness. It's probably a vitamin deficiency. A beautifully written book isn't always a well thought out book, and I get that, especially in case of this one - because it wasn't up to the mark plot and character arc-wise, not to mention, the slightly goofy seeming scientific details. But sometimes, a beautifully written book leaves a far greater impression on you than a well though-out book (hey, I said, sometimes) and this one was one of those few books for me. Somehow (I may be able to better explain how later) I loved this book. If you like dystopian fiction, check out Dystopia 2012 at Bookish Ardour. I read To Kill a Mockingbird as part of the Back to Classics Challenge, but I didn't write a review. A review doesn't always have to be a summary + my thoughts affair. 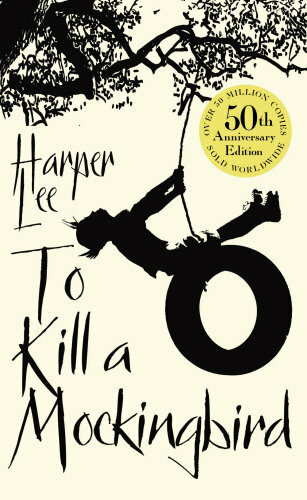 That is why, I've been saving my thoughts about To Kill A Mockingbird (by Nellie Harper Lee) for this day. It may not be my favourite book, but it is not a classic for no reason. This book is not just any bildungsroman, it's a book of how two little kids, who initially think of their father as an old, gray, dull man; learn to see the world through his eyes. 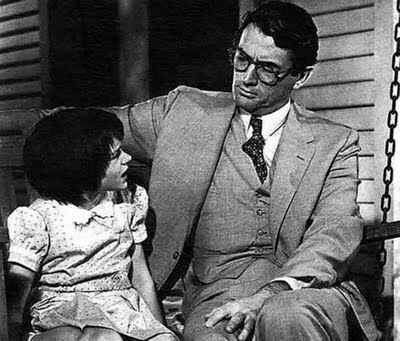 So, here's a Father's Day post about Atticus Finch, probably the best father figure in literature. "If you can learn a simple trick, Scout, you'll get along a lot better with all kinds of folks. You never really understand a person until you consider things from his point of view - until you climb into his skin and walk around in it." 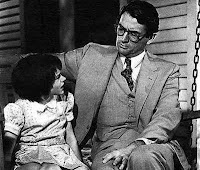 Atticus Finch, the father of Jem and Scout (from whose point of view, we learn the story) is a lawyer and a resident of the (fictional) town of Maycomb, Alabama. He is smart and just (a rare quality for a lawyer) and takes insults rather than hitting back. In a book that contains the most well-shaped, seemingly real characters ever, Atticus Finch stands out as a hero. A good father is not someone who deals with all the problems in his life, while maintaining a seemingly happy and warm bubble of ignorance around his children. I love the way Finch disciplines his children; lets them think for themselves, includes them in everything, let's them know things that are considered widely to be "wrong for kids" and becomes a hero in their minds as well. He keeps them safe, while making sure that they know, what they're being kept safe from, and also making sure that they don't need to be kept safe. He is the kind of father, who respects his children, and I loved him for that. 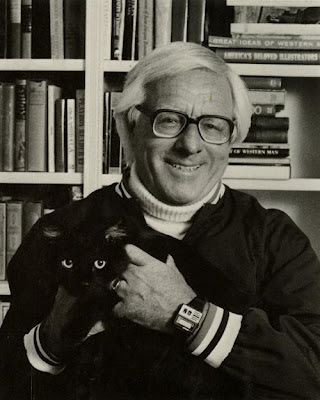 One of my favourite moments in the book is when Jem proudly announces, “Atticus is a gentleman, just like me!" I wrote a Volume-by-Volume review of this book, with the first two reviews here and here. This would have been a review of Volume 3, had I not realized something. Picture me sitting at the window, with rain pouring outside, a cup of hot coffee in my hand and my nose buried in the pages of this fabulous book. I read more than a couple of hundred pages in less than an hour and I wished there were a couple of hundred more pages, when I finally finished the book. I know this goes against the whole point of being a book reviewer, but I really have NO words to describe, how amazing I found the book. Clarke has managed to create in one book, what others would need seven books for. My library copy is due tomorrow, but I'm sure I'm not going to be able to resist just buying the book and reading it all over again. Fantasy couldn't get any better than this, magic couldn't get any more original. Coming back to what I realized... I am not going to write a review for this book, because nothing I say will do justice to it. And, I'm definitely not going to recommend it to anyone I know; because I do not want to go through the whole "I tried it because you told me to, but I gave up after Page 4." or "It's not as great as you thought it was." experience again. Not with this book. This is something that has been on my mind, ever since that Writer's Workshop. We discussed some of the best book beginnings and how important it is to start off the book on the right note. According to me, though, you don't always have to shock or surprise or jolt the reader in the very first paragraph. Sometimes, slow beginnings do work as well. A beginning, for me, is just as important as any other part of the book (the ending may even be slightly more important!) Going through my makeshift bookshelf, I can say with certainty, that the books I really love have both good and bad, not to mention, only okay beginnings. 1. "Happy families are all alike; every unhappy family is unhappy in its own way." 2. "To the murder of Professor Grimaud, and later the equally incredible crime in Cagliostro Street, many fantastic terms could be applied - with reason. Those of Dr Fell's friends who like impossible situations will not find in his case-book any puzzle more baffling or more terrifying. Thus: two murders were committed, in such fashion that the murderer must have been not only invisible, but lighter than air." 3. "No live organism can continue for long to exist sanely under conditions of absolute reality; even larks and katydids are supposed, by some, to dream. Hill House, not sane, stood by itself against its hills, holding darkness within; it had stood so for eighty years and might stand for eighty more. Within, walls continued upright, bricks met neatly, floors were firm, and doors were sensibly shut; silence lay steadily against the wood and stone of Hill House, and whatever walked there, walked alone." 4. "YOU don’t know about me without you have read a book by the name of The Adventures of Tom Sawyer; but that ain’t no matter. That book was made by Mr. Mark Twain, and he told the truth, mainly. There was things which he stretched, but mainly he told the truth." 5. "Everything starts somewhere, although many physicists disagree. But people have always been dimly aware of the problem with the start of things. They wonder aloud how the snowplough driver gets to work, or how the makers of dictionaries look up the spelling of the words. Yet there is the constant desire to find some point in the twisting, knotting, ravelling nets of space-time on which a metaphorical finger can be put to indicate that here, here, is the point where it all began..."
And another beginning I like is that of The Shadow of the Wind by Carlos Ruiz Zafon (about how the narrator visits the Cemetery of Forgotten Books!) I can think of two other authors, who, in their own very different ways, start their books with a bang and they are John Le Carre and well, H. P. Lovecraft. What do you think? Does it matter to you how a book kicks off? Do you have any favourite books with slow beginnings? And what are your favourite book beginnings? Top Ten Tuesday is a weekly bookish meme hosted at The Broke and The Bookish! This week is Top Ten Tuesday Rewind, where you choose one of the topics previously done. I don't know why I hadn't listed these back then! This list doesn't contain any couples; just pairs who worked great magic together in their books! 1. Aziraphale and Crowley from Good Omens: The Nice and Accurate Prophecies of Agnes Nutter, Witch. Who are your favourite bookish duos? A few days ago, I wrote about Volume I of this book. This book just becomes more and more amazing with every single turn of the page. There were times when I realized I almost wasn't breathing and had to force myself to relax. What I like about this book, is that the magic isn't very organized; which is different from the Harry Potter-like magic, which I am more used to. The magician casts spells and creates illusions and visions and even roads to who-knows-where, for that matter. We know how he does it, but there is still an air of mystery to it. It is still astonishing, and magical. It isn't broken down to pieces and studied and turned into a sort of science. And I like that. I remember mentioning my frequent realization, that something BIG was coming. Well: It has arrived, and with a deafening bang. Clarke has masterfully crafted the novel. In the first volume, we get a vague idea about the book. We learn about English magic and the two English magicians; we learn that there is a kingdom of Fairy just like the human kingdom, and that there was once a magician called the Raven King, who ruled these kingdoms, along with Heaven and Hell. In Volume I, the author leisurely builds her setting, introduces us to the main characters and their potentially opposing viewpoints. We spend the major part of Volume II getting to know Jonathan Strange and what an exciting person he is, "entirely at his ease, with his mocking half-smile and his eyes full of smiles and secrets and spells - just as a magicians' eyes should be." Clarke takes us on an entirely different journey, with Strange's antics in the Army and the way he wins wars for the English; by attacking the French with illusions and moving around cities and rivers to his convenience. We get to see a different side of English magic, which is not related at all to the main plot, which is staged in London. But it certainly gives us great insight into Strange's character and his curious nature. The story doesn't move fast in this Volume, unlike the previous one. Instead the author slips a few bits and pieces of information, that might reduce the suspense, if only we knew exactly what they were; details, that seem important, but we don't know why. And at the end, when we least expect it, the author hits us with a lightning bolt-shaped chunk of story. I can't wait to read the rest of the book; you have no idea how hard it was to put it down for the fifteen minutes, that it took me to write this review! 1. I opened Facebook right now and the first update I saw was an old Neil Gaiman and Terry Pratchett interview (on Neil Gaiman's page), on how they wrote Good Omens together! It's really quite funny. "TP: "Neil wrote several thousand words a couple of years ago, which was part of the main plot of Good Omens." NG: "I didn't know what happened next, so I put it aside and I showed it to Terry. One day I got this phone call from Terry, saying 'Remember that plot? I know what happens next. Do you want to collaborate on it, or do you want to sell it to me?' And I said, 'I'll collaborate, please.'" 2. Joss Whedon lists his favourite Buffy episodes! Lie to Me - when Buffy's old school friend Ford trades her to Spike in exchange for immortality. Becoming (Part 2) - The end of season 2, Buffy kills Angel. Something Blue - This was the funniest episode. Buffy and Spike get engaged and Giles goes blind. Hush - When the voices get stolen in Sunnydale; this was one very beautiful episode, don't you think? The Body - Nothing I say can will do justice to this episode. 3. The Great Gatsby trailer, which I also saw a few weeks ago, maybe; I don't have any particular opinions or 'oohs' and 'aahs' to express about this trailer, because I did not particularly love the book. I do want to watch the film, though. 4. I've been visiting and re-visiting this site over the past couple of weeks; it's called Brain Pickings. It is very interesting, check it out! 5. This was posted by Neil Gaiman more than a month ago, and I have read it at least thrice since. An interview of Stephen King by Neil Gaiman, what could possibly go wrong here? "I never thought of myself as a horror writer. That’s what other people think. (...) I was down here in the supermarket, and this old woman comes around the corner – obviously one of the kind of women who says whatever is on her brain. She said, 'I know who you are, you are the horror writer. I don’t read anything that you do, but I respect your right to do it. I just like things more genuine, like that Shawshank Redemption." Speaking of Stephen King, someone sent me this link a couple of days back - Wisdom from Stephen King books; I have hardly read all the books he's written, but the list is pretty good, if you are a fan. 6. Last year, I started reading and loving short stories. As it turns out, 500 new fairy tales/short stories were discovered in Germany (Bavaria) recently, which were once collected by a certain Franz Xaver von Schoenwerth. This is one of the tales, titled The Turnip Princess. 7. And this, lastly, is a blog, that has been in my reading list for a long time. It is pleasantly different from all those book blogs, which only contain book giveaways, ARC reviews and memes. Along with reviews and book quotes, there is a huge collection of bookish pictures, that I absolutely adore looking at, even if only in my updates, sometimes! All book lovers should check it out!